... Mexico is a country with a reputation for political corruption and a healthy disregard for the individual rights of its citizens. Still, Holder and the Obama administration think that limiting the Second Amendment rights of U.S. citizens is a cure for drug violence in Mexico. However, according to a recent poll conducted by The O'Leary Report and Zogby International, a vast majority of the American voting public disagrees. "Mexican officials, gun control groups and officials at the Department of Homeland Security claim drug cartels are crossing the U.S. border in order to obtain guns illicitly. Others say that the Mexican drug cartels are equipped with military hardware including grenades, anti-tank missiles and mortars - all weapons that are not available to the American public. Which of the following do you think is the main source for Mexican drug cartel arms?" Sixty-five percent of voters say that the international black market is the main source for Mexican drug cartel arms; while only 13.5 percent think these arms are coming from U.S. gun stores (3.5 percent think the arms are coming from somewhere else and 18 percent are not sure). Article here. Despite the anti-gunners' full court press to deceive the public and lay the groundwork for another "assault weapons" ban, looks like the American public isn't buying it. Or at least not yet. Here's a summary for the time- or attention-challenged: Never surrender freedom for laws that can't affect criminals; they disobey laws for a living. Nobody is surprised that Attorney General Eric Holder wants to make good on his promise to ban guns. We just didn't know whose tragedy he'd seize to advance his agenda. Now we do. It's the drug-driven death and violence in Mexico at the hands of ruthless criminal cartels. Barely a month on the job, Holder cited the Mexican cartel killings as the excuse to resurrect the Clinton gun ban. Though a new face to some, Holder is a rabid Second Amendment foe from the Clinton administration who helped orchestrate the 1994 Clinton gun ban. America has made this mistake already. So let's learn the lies that led to their gun ban. Nobody can substantiate claims that U.S. guns cross the border "by the thousands" or "account for 95% of weapons used by Mexican drug gangs." Because it's not true. Replying to Feinstein in subcommittee hearings last week, William Hoover, assistant director of field operations at the Bureau of Alcohol, Tobacco, Firearms and Explosives, said, "The investigations we have, that we see, for firearms flowing across the border don't show us individuals taking thousands of guns a day or at a time flowing into Mexico." Yet reporter after politician after news anchor parrot the lie as readily as high schoolers gossip, and with equal disregard for truth. That's how gun abolitionists claim Mexican gun laws are so strict that our "weak laws" (read: freedoms) are to blame for "fueling the violence" in Mexico. • You have to believe these butchers and beheaders break every Mexican law they want except Mexican gun laws, which they honor -- while they break America gun laws. • You have to believe that Mexico's drug cartels, which possess the wealth and armies of nations, prefer American semiauto target and hunting rifles over fully automatic machine guns and any other military arms they want to crush opposition. • You have to believe Mexican drug lords -- who make Forbes magazine's list of billionaires -- don't get large lots of weaponry on the transnational black market but instead choose to trifle with paperwork at U.S. gun stores. • You have to believe that narco-terrorists who buy fragmentation grenades, grenade launchers, explosives, body armor, biometric security equipment, infrared surveillance technology and intelligence-grade reconnaissance gear will salute and obey a new American gun law -- if only we'd pass one. As much as 90 percent of the assault weapons and other guns used by Mexican drug cartels are coming from the United States, fueling drug-related violence that is believed to have killed more than 7,000 people since January 2008, according to estimates by Mexican and U.S. law enforcement officials. But the political obstacles to addressing the U.S.-to-Mexico weapons flow are dramatically underscored by Holder's experience in just the last few weeks. When Holder was asked about the assault weapons issue again at another press conference on March 25, he steered away from even mentioning a new weapons ban. "Well, I mean, I think what we're going to do is try to, obviously, enforce the laws that we have on the books," Holder said, adding that he planned to discuss the flow of illegal arms with "our Mexican counterparts" during an upcoming trip to Mexico. SPRINGFIELD — For the second time in a year, an attempt to toughen state gun laws fell short of passage in the Illinois House. The proposal, which failed on a 55-60 vote Wednesday, aims to close the so-called private-sale loophole. Under state law, people buying firearms from private sellers at gun shows must undergo a background check. But, other private handgun sales are not subject to background checks. Supporters say current law allows guns to get into the hands of criminals who would otherwise not be able to buy firearms. HB1623 The Concealed Carry Privacy bill had a partial hearing today. If you followed us on Twitter you know that the hearing abruptly ended because the full Senate was about to convene. The bill will be reconsidered Tuesday the 31st. We feel good about the bill in the committee but David Bailey, Managing Editor of the Arkansas Democrat Gazette and member of the Arkansas Press Association (APA) wasted no time in hyping the supposed "dangers" of the bill. I guess he doesn't consider violating the privacy of an undercover police officer "dangerous. "He mostly brought up issues centered around people who applied for CHL's in our state and been denied a permit. Which actually makes our case for us that, the system works. They claim that they should have access to the information as a matter of a check against the government. But then we distributed the original blog post that Max wrote which contained the permit list and it pretty much dashed the idea that it was done in an ethical, journalistic manner. When committee members saw the blog posting, their reaction seemed to be one of amazement. The latest development is that Arkansas Governor Mike Beebe finally picked a side, I am sad to say that it was not the side of law abiding gun owners. This from Today's THV, "Gov. Mike Beebe says he prefers to keep the list of Arkansans licensed to carry concealed handguns public, but he stopped short of saying he'd veto a bill to make that information secret. Speaking to reporters Thursday, Beebe said that he prefers to keep the list open under the state's Freedom of Information Act. Beebe would not say he would reject a bill by Rep. Randy Stewart, a Democrat from Kirby, to seal that information from public scrutiny. The Senate State Agencies and Governmental Affairs Committee heard some testimony Thursday on Stewart's proposal, but did not take any action. The committee plans to continue a hearing on the bill next week. The bill has already passed the House." Gov. Mike Rounds has signed a bill that eliminates South Dakota's post-purchase 48-hour waiting period to buy a handgun. The House passed the bill 67-1 on Tuesday. The Senate had passed it unanimously in January. "Law enforcement trainer, author, and grassroots activist of color" (and not to forget, a pastor), Kenn Blanchard has been a voice of reason in the Second Amendment movement since the early Nineties. His book, "Black Man with a Gun," was written "to provide people in the African American Diaspora a resource to learn about gun safety and personal responsibility from one of their own." A founder of the Tenth Cavalry Gun Club, "derived from the famous 9th and 10th Army Horse Cavalry's, better known for their Native American given name 'Buffalo Soldiers,'" Blanchard has also started The Urban Shooter Association to promote and support his weekly podcast. DC: Why are so many African American political and religious leaders dead set against keeping and bearing arms? How does that tie in with other parts of their message? KB: It is easy. There are few topics that are as “evergreen” as gun control. Leaders and clergy that adopt the anti-gun stance have an easier role. The path of least resistance is favored over a deeper dive into the truth. Do you tell the children that there is no Santa Claus coming down the chimney or do you keep up the illusion till they figure it out? Secondly, if they ride the anti-gun fence long enough they will up their status and be afforded personal protection, bodyguards and a lifestyle where they won’t need to protect themselves. They become pastors with entourages. Politicians get police protection. Celebrities with bodyguards don’t need to carry a firearm for their home. They have gated communities and things we can’t afford. Senate Bill 1035 would have allowed people to carry concealed weapons into restaurants or clubs that serve alcoholic beverages. Guns are allowed into restaurants as long as they are displayed openly, under current state law. "Allowing concealed weapons into restaurants and bars that serve alcohol puts the public, the employees and our public safety officers at risk," Mr. Kaine said. "I take seriously the objections of law enforcement to this measure." House Bill 2528 would have prohibited local law enforcement agencies from choosing to conduct voluntary gun buyback programs and then destroying the weapons. Senate Bill 1528 would have allowed the firearms training required to receive a concealed weapons permit to be completed online. "Allowing the testing to be done online would weaken the ability of the commonwealth to determine who is actually taking the test and open up opportunities for individuals to receive a permit under fraudulent circumstances with no guarantee that they can use a weapon safely," Mr. Kaine said. There is growing suspicion in the firearms community that it is no coincidence the administration is ramping up the rhetoric about this country’s “shared responsibility” for the bloody drug war raging in northern Mexico, while “Obama-friendly” news organizations lend emphasis to renewing the semi-auto ban. At the same time, the anti-gun Brady Campaign to Prevent Gun Violence has just released a report called Exporting Violence: How Our Weak Gun Laws Arm Criminals in Mexico and America. But when she was quizzed by NBC’s Andrea Mitchell on the drug war, Mitchell seemed rather preoccupied with renewal of the gun ban in this country, a ban which has had questionable results, as I reported here. Other news agencies have editorialized for renewal of the ban. All you have to do is take one look at the recent headlines and you'd think the U.S. has been tried, convicted, and sentenced for causing drug war violence in Mexico. All this is intended to raise public support for bringing back the expired "assault weapons ban." The thing is, the public isn't buying what they're selling. A recent Zogby poll and O'Leary Report show that only 13.5% of those surveyed think the United States is to blame. It is pretty easy to come to that conclusion since the war south of the border is being fought with machine guns, rocket propelled grenades, and other similar weapons that just aren't available at gun shows. Why would a drug cartel buy a semi-automatic rifle (the kind the legislation Secretary of State Hillary Clinton wants would ban) when they can just as easily get fully automatic weapons illegally on the black market? It just doesn't add up, and the American public isn't as stupid as they're being taken for. ... In addition to committing additional law-enforcement assets to the border, the U.S. is also providing Mexican authorities with intelligence, high-tech detection gear, sophisticated sensors and night-vision equipment for combating cartel “foot soldiers” armed with automatic weapons, hand grenades, heavy machine guns and soviet-era rocket propelled grenade launchers. This help is certainly warranted. It is in our national interest that the Calderon campaign against the cartels succeeds. Reality check: resurrecting the so-called “Assault Weapons Ban” that expired in 2004 isn’t going to do anything to help the Mexican government deal with drug cartels or any other criminal organizations. Nor was the O-Team’s decision to stop the Defense Logistics Agency (DLA) from allowing surplus military brass cartridges to be re-loaded going to stop a single bullet from reaching criminals. Thankfully, that inane rule has been reversed, saving law-abiding gun owners -- and our heavily indebted government -- money. The Mexican drug cartels aren’t being armed by law-abiding Americans. Rather than trying to re-enact meaningless legislation based on the appearance of a firearm or the shape of a magazine, the O-Team and their congressional allies need to focus on securing our borders and providing the resources to enforce the laws we already have on the books. Infringing on the 2nd Amendment rights of U.S. citizens won’t make Mexicans, or any of us, any safer or more secure -- no matter how severe the crisis. One week after four Oakland police officers were gunned down by a semi-automatic weapon, there's a new plan asking the federal government to ban assault weapons. State and local officials are pushing for a crackdown on these weapons. An AK-47 assault rifle was used to kill the four Oakland police officers last Saturday. California has the toughest ban on assault weapons in the nation. But it doesn't stop people from buying in other states. "We're calling on the Congress to remake gun control a top priority now, and to reauthorize the assault weapons ban right away," said L.A. Mayor Antonio Villaraigosa. In 1994, Sen. Dianne Feinstein used the tragedy of San Francisco's 101 California massacre to push a decadelong ban on assault weapons through Congress. But even the horror of Saturday's slayings of four Oakland police officers is unlikely to break through the bipartisan opposition that blocked the renewal of that ban in 2004. House Speaker Nancy Pelosi, D-San Francisco, Senate Majority Leader Harry Reid, D-Nev., and dozens of House Democrats have said they oppose efforts to bring back the national ban, either because the timing is wrong or because they oppose gun control. Pelosi said she hasn't even discussed the possibility of a renewal with President Obama and his staff, who face urgent issues from fixes to the nation's economy to health care reform. "I am prepared to wage the assault weapons battle again and I intend to do so," Feinstein said in a speech to the Senate last month. "I have been quiet about this because there are many other pressing needs of this nation. But with the help of the president, the administration and the people of this great country, we do need to fight back." Feinstein has support in high places. During last fall's campaign, Obama said he wanted to reinstate the ban, and last month Attorney General Eric Holder acknowledged that it remains part of the administration's agenda. HELENA – A compromise on a bill aimed at expanding gun rights and getting rid of the need for concealed weapons permits is advancing in the state Senate. House Bill 228 has been the subject of a tough fight between police groups and gun groups such as the National Rifle Association. But the interest groups sat down again with lawmakers Friday morning to hammer out some details the legislation. The compromise still allows people to use a gun in self-defense without first fleeing. Sen. Dan McGee, the Billings Republican leading a legislative subcommittee making the changes, said that is means people can more easily use deadly force on home intruders. The Senate compromise version would still exempt people from the requirement of a permit for carrying a concealed weapon in town — although it now clarifies that felons could not do so. It would also keep the current permitting system in place for those who voluntarily want one in order to carry a gun in other states that recognize Montana's permits. After Columbine, Colorado voters approved a measure requiring background checks on all gun-show sales. But as the 10th anniversary of the high school massacre approaches, lawmakers are considering a bill that would waive the checks for anyone holding a concealed-carry permit. Police chiefs and sheriffs are among those who testified against the measure, which is scheduled to be heard by the full Senate next week. The Cleveland Plain Dealer is reporting that Cuyahoga County Sheriff Gerald McFaul, a long-time opponent to gun rights in Ohio, has tendered his resignation after months of allegations about his misconduct in office. McFaul has been under fire since the beginning of the year over questions of improper fund-raising activities, including having deputies sell tickets for his fund-raisers while on county time, for doing special favors for friends and relatives, and most recently for not reporting gifts he is reported to have accepted from employees. ... America has squandered the human sacrifice, blood, sweat and tears of two generations in less than seventy years. We have been an independent country for 226 years. From 1783 until 1946 was an unrelenting upward trajectory for the beacon of the free world. With the end of World War II, America was the last country standing. Germany and Japan were in shambles. Russia had lost millions of citizens, with Stalin about to murder millions more. Great Britain was a shell of its former self. The American Empire had been born. We were the manufacturer to the world. We rebuilt Europe and Japan. Our military was dominant. We made the best automobiles. We built 41,000 miles of national highway over two decades. In 1946, one in three U.S. workers was employed in the manufacturing industry. Today, less than one in ten workers makes something. In the years following World War II, the United States ran trade surpluses of 2% to 4% of GDP. We regularly ran surpluses until the late 1970’s. Since the late 1970’s, the United States has run increasingly large trade deficits, reaching 6% of GDP in 2007. For the last three decades, Americans have tried to spend their way to prosperity. The government politicians and their moneyed backers have sold the idea that Americans could be the thinkers for the world, while other countries could do the menial work of producing stuff. After thirty years we are left with a hollowed out economy of paper pushers. It may be a reach to transition the Wall Street geniuses who created MBSs, CDSs, and CDO’s into jobs building bridges. The manufacturing jobs are gone. Our workers are left to sweep the streets they used to own. After three decades of burning our furniture to keep warm, we are left owing the rest of the world $2.7 trillion. Many of these countries don’t like us. Ben Bernanke is actively trying to drive the value of the U.S. dollar down, while decreasing interest rates paid on this government debt. As Ben prints trillions of new dollars, the value of China’s, Japan’s and the oil exporting countries’ holdings goes down. The U.S. will run a $2 trillion deficit in the next year. We need these foreign countries to buy at least $1 trillion of our new debt. We are sure they will do so. Our reasoning is, what else can they do. From a purely financial standpoint, it is insanity for a country to make an investment in an asset paying 2.5% interest, when in one day last week the Federal Reserve purposely knocked the value of the dollar down 5% in one day, wiping out two years of interest income. The Chinese have a long-term plan to rule the world. They are buying up natural resources throughout the world. The walls are closing in on the U.S. The U.S. solution is to print more dollars, borrow from future generations, and tax their citizens more. Ben Bernanke has rolled the dice, but the fear is in his eyes, not our enemies’. We will shortly realize that our castles were built upon pillars of salt and pillars of sand. FLINT, Michigan -- Look in any direction from Bianca Bates' north Flint home, and you'll see graffiti-covered siding, boarded-up windows and overgrown lots. Bob Campbell, Brown's spokesman, said the acting mayor was speaking hypothetically about a worst-case scenario, "not something that would be laid out in the next six months" while he's in office. But City Council President Jim Ananich said the idea has been on his radar for years. The city is getting smaller and should downsize its services accordingly by asking people to leave sparsely populated areas, he said. Article here. We may see more of this as the economy worsens. Call it the Escape From New York scenario. Article here. Yup, that's the path we're on. NRA files amended complaint in lawsuit against D.C.
Labels: Gun Control, Lawsuits, NRA, Washington D.C.
Read the rest of the article here. Better not get sick, when Hope and Chains comes to town. A Loudoun County couple out for their routine early-morning walk over the weekend might have been randomly attacked by as many as three assailants in the Lansdowne area, the county sheriff said yesterday. William Bennett, 57, was found dead before 6 a.m. Sunday along Riverside Parkway near Rocky Creek Drive by a sheriff's deputy investigating a report of a suspicious vehicle in the area. His wife, Cynthia, 55, was found critically injured about 30 minutes later across the road, beyond a bloodied white fence in a muddy ditch, Simpson said. "It has the look and feel of a random act," Simpson said. "I'm not sure how much you do to prepare for that. . . . Everybody has the same thought on their mind: 'See, that could have been me.' "
The Bennetts live in the Potomac Station subdivision in the Leesburg area, less than a mile from where they were found, Simpson said. They suffered severe blunt force trauma, but the medical examiner has not yet provided an official cause of death for the husband, Simpson said. At 5:38 a.m. Sunday, a resident reported hearing a commotion and seeing several people get inside a white panel van that kept coming and going, authorities said. A deputy responded within five minutes and discovered the man's body on a grassy patch along Riverside Parkway, near a walking path that leads to Goose Creek, Simpson said. Authorities combed the area, and, as the sun came up, investigators noticed blood across the street on a white fence that lines the road, Simpson said. It was then that Cynthia Bennett was discovered about 50 yards away in a ditch. She was flown to Inova Fairfax Hospital and was in critical condition yesterday. Investigators have not been able to talk to her, Simpson said. The couple were wearing jogging outfits when they were found. Article here. We don't know if Mr. Bennett was carrying a firearm when he and his wife were attacked, but if he wasn't, I'll bet he died wishing he had. Obviously, just because you have a gun doesn't mean the encounter will turn out well for you, but the odds that it will are certainly better with a gun, than without. ... Simpson said investigators are also trying to determine whether the retired lieutenant colonel with the Army Special Forces has held any jobs since leaving the CIA. Bennett and his wife, residents of nearby Potomac Station, were on their routine early morning walk in the Lansdowne area when they were attacked by as many as three assailants, authorities said. A sheriff's deputy responding to a report of a commotion and a suspicious white panel van about 5:30 a.m. in the Lansdowne area discovered William Bennett's body on the side of Riverside Parkway, near a gravel path not far from Rocky Creek Drive. His wife was found about 30 minutes later in a ditch, beyond a bloodied white fence across the street. Both had suffered blunt force trauma, but no weapon was recovered, and they might have been beaten. Bennett's slaying is the first homicide this year in Loudoun, where killings usually register in the low single digits annually. The sheriff's office investigated three homicides last year, up from one in 2007. Authorities described the Lansdowne area as fairly quiet and said crime there is generally limited to "quality of life" issues such as property destruction and car theft. Perhaps the Bennetts were lulled into a false sense of security by that fact. Lesson: If you carry, you should consider carrying even in "safe" areas, because it will likely be even safer for you if you do. Tent cities in the Socialist Utopia? California Governor Arnold Schwarzenegger said a make-shift tent city for the homeless that sprang up in the capital city of Sacramento will be shut down and its residents allowed to stay at the state fairgrounds. Schwarzenegger said he ordered the state facility known as Cal-Expo to be used for three months to serve the 125 tent city residents, some of them displaced by the economic recession. The encampment may be shut down within a month, said Sacramento Mayor Kevin Johnson. The move comes after the Sacramento City Council last night agreed to spend $880,000 to expand homeless programs. California, home to one of every eight Americans, has been particularly hard hit by the housing market collapse after many residents turned to exotic mortgages to afford homes. The tent city, which has long existed along the banks of the America River, gained national attention last month when some of its recently homeless residents were featured on the Oprah Winfrey Show. Right now, Sheriff's and Police Chiefs have the final say about who can carry a gun...but a bill now in the State Assembly, would change that. Some people believe changing the law would promote the right to bear arms but others feel it just opens Pandora's box. Currently it takes a special permit and the approval of your local Sheriff's Department for someone to be allowed to carry a concealed weapon. Certified firearms instructor, Ron Etchells, teaches the concealed carried training class and says the classes start with "The basics, with just fire arm manipulation. Knowing all the parts and different ammunition's cross referencing ammunition's as well and approximately right down to four hours of live fire." The Sacramento County Sheriff's Department doesn't support the bill saying "It takes away the discretion of local law enforcement" to issue the permit. It's that fact that also concerns advocates against domestic violence. Beth Hassett, Executive Director of Women Escaping A Violent Environment, says of the bill, "If they have a concealed weapon, somebody who is being stalked, a person who has been out of a relationship for a long time may have no idea that their former partner may come after them and kill them. But not everyone agrees with the idea that more accessible permits means more danger. John Barritt, oowner of Badger John's Huntin Stuff believes the bill is aimed at responsible gun owners and may keep the streets safer saying "There's been studies done and you can look at statistic all the way across the country, people that have CCW permits are the lowest crime group out of any segment or society." Article here. Unfortunately, given that this is anti-gun, Brady bunch "A" rated California, don't expect this to go very far. It's amazing how clueless the domestic violence "victim's rights" advocates seem to be. You would think they would support a shall-issue law to allow victims of domestic violence to be able to lawfully carry guns to protect themselves from their abusers. Remember, you don't need a permit to carry a loaded gun concealed on your person anywhere in America. How do we know that this is irrefutably true? Because violent criminals carry guns every day, everywhere in America, and they don't have permits. Why? Because you don't need one. Only folks who are predisposed to obeying the law get permits. I know, preaching to the choir. I got tired just watching this guy. Oh, to be young again! Read the rest, including the text of the letter, here. Haven't these jokers ever heard of the Holocaust? You know, that little government lovin' the Nazis gave to a couple of million Jews, after they disarmed them. Labels: Gun Control, Holocaust, Jews, Washington D.C.
AUSTIN — Texans would be allowed to stow their guns and ammo inside their locked cars or trucks while at work and parked on employer property under a controversial bill passed Wednesday by the state Senate. The Senate voted 31-0 to prohibit employers from enforcing restrictions against employees possessing a legally owned handgun or ammunition inside a locked vehicle while in a company parking lot. Firearms and ammo must be stored out of sight. Supporters say employer rules banning guns in a company parking lot infringe on their Second Amendment right and their ability to protect themselves as they travel to and from work. Thanks to Sen Wilkins of Pine Bluff, HB 1237 The bill that would remove churches from the list of prohibited places in the concealed carry statute, died in the Senate Committee on Judiciary on a 4-2 vote. After the bill failed in committee last time, the bill was amended. Instead of the version we believe was most appropriate, which would remove churches from the list altogether, it would have now included churches on the list of prohibited places but allow churches to allow CHL holders to carry on their property if they chose to. This was done over a concern that churches would have been required to place a sign at every entrance proclaiming, "the carrying of hanguns is prohibited." Then there was the Church shooting in Illinois. After this Senator Wilkins made the remark that he honestly didn't know how he felt about it and that he could change his mind. He also said he wanted to hear more testimony on behalf of the bill, so we brought him ten people to speak on behalf of the bill, eight of them were pastors. Some came from as far away as Springdale. They all came to speak on behalf of the bill mostly because Sen, Wilkins told us that he "wasn't sure." He honestly wasn't sure and wanted to know how other pastors felt. He wanted to hear from these people. So in a good faith effort we tried to meet him half way, even sacrificing some language in the bill we believed wasn't the best option. We knew we had 4 votes we just needed to convince him that this really mattered to people and that we didn't want to let an Illinois church shooting happen here. So just before HB1237 was heard, Sen Wilkins's bill regarding stalking was being discussed and the hearing became contentious. His bill failed in committee. When he was done with his bill he got up and walked out. He just walked out. And he didn't come back untill after the vote was taken on HB 1237. LONG BEACH - A City Council vote on a proposed gun ammunition registration law is being postponed, police officials said Monday. The issue had been placed on the agenda for today's meeting, but is being pulled because unanswered questions remain, said Deputy Chief Bill Blair. He said community members had asked a slew of questions about the law during the Public Safety Committee hearing last month, but that he was still waiting on some answers from the City Attorney's Office. Still, Blair said he doesn't expect changes to be made to the law, which is designed to deter felons from buying ammunition. Under the ordinance, anyone who buys ammunition would have to register their name, address and date of birth; the date of the transaction; driver's license or other identification number; brand and type of ammunition purchased; the purchaser's signature; name of the sales person in the transaction; and the thumbprint of the purchaser. Why are so many Americans so depressed about things these days? It is perhaps not just the economy. I think the answer is clear: all the accustomed referents, the sources of security, of knowledge and reassurance appear to be vanishing. Materially, we still enjoy a sumptuous lifestyle in comparison with past generations—and the world outside our borders. America remains the most sane and successful society on the planet. But there is a strange foreboding, a deer-in-the-headlights look to us that we may be clueless Greeks in the age of Demosthenes, played-out Romans around AD 450, or give-up French in late 1939—with a sense it cannot go on. Why? Let us count the ways. Today while President Obama railed against AIG bonuses (imagine damning the bonuses you signed into law to the execs from whom you took over $100,000 in campaign donations! )—the congressional budget office “found” another trillion or so dollars in anticipated deficits that Team Obama lost. I think instead the worst element is a sort of ill-feeling about ourselves, an unhappiness as we look in the mirror and see what we are doing to our dignity in this, the hour of our crisis. We are starting to fathom that when times got iffy, we lacked the resilience of the proverbial Joads and the grit of that tough Depression-era generation, and certainly we seem different sorts from those who built and flew B-17s amid the Luftwaffe. Instead, this generation has gone quite stark raving mad the last seven months, hysterical, and decided we would simply borrow, charge it, print money, blame, accuse—almost anything other than roll up our sleeves, take a cut in our standard of living, pay off what we owe, admit that we lived too high on the hog, and find a certain nobility in shared sacrifice. Read the whole thing here. Perhaps the current and deepening economic adversity we face will revive some of that "can-do" spirit, and that in adversity, we will find strength. Unfortunately, decades of cultural conditioning and the vilification of success -- in our schools, colleges, and universities ("America is bad, capitalism is evil"), by the mainstream media (headliine: "America bad, capitalism evil"), by Hollywood ("America is bad ... the movie"; now playing: "Capitalism is Evil (except for Hollywood), Part MMXXVIII"), by leftist politicians ("America is bad, but don't worry, big government is here to 'help'") -- have left a greater number of us, as a nation, less capable, more dependent, less self-reliant. So we'll see. What's the old adage: If you fail to prepare, prepare to fail. We may be testing that theory as we speak. As a nation we've been living beyond our means, and now the bill is due. The time of reckoning for our profligacy has come, and the longer we try to postpone that reckoning (essentially by looting our grandkids' future prosperity), the more painful it will be. The only options available to us all involve pain. The question is not if we'll experience pain, but when and how much. And in general, the sooner you deal with a problem, the less painful the solution. Unfortunately, our elected and unelected elites seem blind to this reality, instead heaping on more debt on our backs, and the backs of future generations of Americans. Perhaps the Baby Boomers will go down as the most selfish, self-centered generation in American history. Despite all that, I remain cautiously optimistic, however. I think it was Winston Churchill who once quipped: "You can always count on Americans to do the right thing ... after they've tried everything else." So hopefully we won't continue on the "everything else" path much longer. 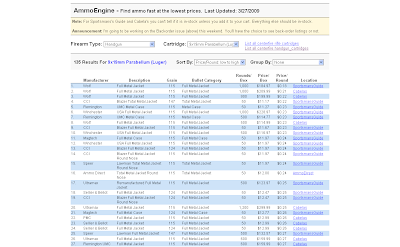 For those looking to make some ammo purchases, you might want to take a look at AmmoEngine.com, where you can search by type (handgun, rifle) and caliber, and sort by price per round or price per box, and group by manufacturer. TOPEKA, Kan. (AP) - Voters may get to decide next November whether Kansas should amend its constitution to clarify that the right to bear arms is an individual right, not a collective right. A measure placing the issue on the 2010 general election ballot cleared the Senate by a 40-0 vote Tuesday. A similar resolution is awaiting action in the House. ENGLEWOOD — A city resident claims Englewood deprived him of his constitutional rights to carry a firearm and that police officers falsely arrested him during the 2007 Fine Arts Festival. According to his lawsuit filed March 19 in Montgomery County Common Pleas Court, Kent Maynard claims he was stopped and questioned by police for openly carrying a 9mm pistol during the festival at the city's Centennial Park. Members of Congress may be alarmed by the surge in Mexican drug violence and its potential to spill across the border, but when talk turns to gun control, opposition from both Democrats and Republicans grows fierce. Attorney General Eric H. Holder Jr. found that out when he proposed reinstituting a U.S. ban on the sale of certain semiautomatic weapons. Many lawmakers balked. The 1994 ban expired after 10 years. "The Second Amendment Task Force opposes the discussed ban and will fight any attempts that infringe on our Second Amendment rights," said Rep. Paul Broun, Georgia Republican, a chairman of the group. Six Democrats and six Republicans co-signed his statement. Labels: Assault Weapons, Gun Control, Kansas, Ohio, Washington D.C.
A block from my apartment, on a still largely mom-and-pop, relatively low-slung stretch of Broadway, two spanking new apartment towers rose just as the good times were ending for New York. As I pass the tower on the west side of Broadway each morning, one of its massive ground-floor windows displays the same eternal message in white letters against a bright red background: "Locate yourself at the center of the fastest expanding portion of the affluent Upper West Side." Successive windows assure any potential renter that this retail space (10,586 square feet available! 110 feet of frontage! 30 foot ceilings! Multiple configurations possible!) is conveniently located only "steps from the 96th Street subway station, servicing 11 million riders annually." Here's the catch, though: That building was completed as 2007 ended and yet, were you to peer through a window into the gloom beyond, you would make out only a cavernous space of concrete, pillars, and pipes. All those "square feet" and not the slightest evidence that any business is moving in any time soon. Across Broadway, the same thing is true of the other tower. That once hopeful paean to an "expanding" and "affluent" neighborhood now seems like a notice from a lost era. Those signs, already oddly forlorn only months after our world began its full-scale economic meltdown, now seem like messages in a bottle floating in from BC: Before the Collapse. And it's not just new buildings having problems either, judging by the increasing number of metal grills and shutters over storefronts in mid-day, all that brown butcher paper covering the insides of windows, or those omnipresent "for rent" and "for lease" signs hawking "retail space" with the names, phone numbers, and websites of real estate agents. I hadn't paid much attention to any of this until, running late one drizzly evening about a month ago, and needing a piece of meat for dinner, I decided to stop at Oppenheimer's, a butcher shop only three blocks from home. I had shopped there regularly until a new owner came in some years ago, and then the habit slowly died. The store still had its awning ("Oppenheimer, Established 1964, Prime Meats & Seafood") and the same proud boast of "Steaks and Chops Cut to Order, Oven-ready roasts, Fresh-ground meats, Seasonal favorites," but you couldn't miss the "retail space available" sign in the window and, when I put my face to the glass, the shop's insides had been gutted. Taken aback, I made my way home and said to my wife, "Did you know that Oppenheimer's closed down?" She replied matter-of-factly, "That was months ago." Okay, that's me, not likely to win an award for awareness of my surroundings. Still, I soon found myself, notebook in hand, walking the neighborhood and looking. Really looking. Now, understand, in New York City, there's nothing strange about small businesses going down, or buildings going up. It's a city that, since birth, has regularly cannibalized itself. What's strange in my experience -- a New Yorker born and bred -- is when storefronts, once emptied, aren't quickly repopulated. Two fleas from Detroit had an agreement to meet every winter in Miami for a vacation. Last year when one flea gets to Miami, he’s all blue, shivering and shaking, damn near frozen to death! A year goes by, and when the first flea shows up in Miami he is all blue, and shivering and shaking again. Damn near frozen to death! “Well then, what happened?” the first flea asked. North Carolina U.S. Senator Richard Burr, along with 14 other cosponsors, introduced legislation that would end a seemingly arbitrary process by which the government "strips" veterans and other Department of Veterans Affairs (VA) beneficiaries of their Second Amendment rights. Currently veterans who have a fiduciary appointed to act on their behalf are deemed "mentally defective" and are reported to the FBI's National Instant Criminal Background Check System (NICS), a system which prevents individuals from purchasing firearms in the United States. The Veterans' Second Amendment Protection Act would require a judicial authority to determine that a VA beneficiary poses a danger to themselves or others before VA may send their names to be listed in the FBI's NICS. Fifteen years ago there were 23 federal firearms licenses issued in Belchertown. "I would say that's a pretty major decline," said Rich Kimball, of R&R Gun Sales, 450 State St., and one of the three remaining license holders. Stricter federal licensing regulations dating back to 1993, plus the overall climate in Massachusetts with some of the toughest firearms laws in the country, have made it tough for gun dealers in the Bay State, according to Kimball. The combination, he says, "caused a lot of dealers to get out of the business." Since 1994, the number of federal firearm licenses - FFLs - issued in Massachusetts has declined from 4,109 to 531, or by 87 percent. In 1993 there were 240,000 federal firearms licenses issued nationwide. As it was pointed out at the time by one pro-gun control group, there were more licensed firearms dealers in the United State than there were gas stations. Since then the number has declined to about 109,000, or by 62 percent, according to the Bureau of Alcohol, Tobacco, Firearms and Explosives. The decline is part of a national trend that dates back to two pieces of legislation, according to the federal agency that oversees the licensing. The first is the Brady Bill, named after White House press secretary James Brady who was shot in an assassination attempt on President Ronald Reagan in 1981. It increased the license fee from $10 per year to $200 for the first three years and $90 for each three-year renewal. The second piece of legislation was the Violent Crime Control and Law Enforcement Act of 1994, also known as the Crime Bill. It requires applicants for the federal licenses to notify their local police department, submit fingerprints and a photo with the application, and certify that their businesses adhere to local zoning regulations. It also requires gun dealers to have an established location for their shops that must be separate from their residences. This eliminated many hobbyists and part-time dealers. CHARLESTON — Controversy often inflames passions, and mindful of this lawless age and a propensity of some in society to go over the edge, a few lawmakers want the right to arm themselves without a weapons permit. One sponsor of such a House bill, in fact, Delegate Mark Hunt, D-Kanawha, relayed a personal threat directed at him and his family, penned by the hand of a convict. A self-described “monster,” the man behind bars warned of what he intended to do to Hunt and his children. Comment: What's good for the goose is good for the gander. Shouldn't the citizens Mr. Hunt represents have the same RKBA rights as their elected servants? Mr. Hunt's complaint appears to be that West Virginia law also applies to him. Columnist asks: Would you know an "assault weapon" if you say one? ... If you answered "D)all of the above" congratulations, you qualify for a California Senate seat! You'd also be wrong. Those who want to take away gun from civilians know they can't take them all at once. The only way to get them is to vilify and ban one class of firearms at a time. Two of the most frequent targets are handguns and "assault weapons." But, what exactly is an assault weapon, and why do they claim we need to ban them? Actually, the term "assault weapon" is made up. It is a derivative of the real phrase "assault rifle" which is a selective fire (can switch between automatic and semi-automatic) rifle or carbine firing ammunition with muzzle energies intermediate between those typical of pistol and high-powered rifle ammunition. If you look at the above pictures again, only one of the above is an assault rifle, and that is "B", a M-16. Both the AR-15 (A) and the SIG 556 (C) are semi-automatic only. But the gun grabbers want to ban them because they are evil looking black rifles. Since there is a very specific definition of an assault rifle, the gun control crowd needed something that sounded similar and scary so that they could apply that label to this scary looking class of firearms. So, they made up "assault weapon". Sounds close enough. Looks are the only thing these firearms have in common with real assault rifles. No army or terrorist group in the world would limit themselves to such weapons as they are primarily suitable for sporting purposes and civilian self defense, not the battlefield. A study done by the US Department of Justice found that these kinds of guns are used in less than 1% of all gun crimes. And yet, these unscrupulous individuals have absolutely no qualms about lying to the public in order to sell their agenda. One of the reasons this incident made the headlines is because how rare it is that such an incident occurs. That hardly makes for a description of our cities as "demilitarized zones." Much more troubling is the fact that witnesses to the crime were cheering the deaths of these officers. But, why focus on the root of violence and try to fix the real problem when you can just blame the gun and try to disarm innocent, law-abiding citizens? Mayor Greg Nickels is going forward with a controversial executive order which would ban "dangerous weapons" - including firearms - on Seattle owned parks and properties. An exact date has not been set yet for when the ban will go into effect. However, a spokesman for the Mayor's office said the ban is currently expected to begin sometime in May. Coincidentally, this places the time somewhere around the one-year anniversary of the freak shooting incident at Folklife, last year, that left two people injured and was the casus belli for the order. Yet another weapons bill hit committee this afternoon as the House Judiciary Committee considered Rep. Mark Martin’s legislation to allow people to carry firearms in plain sight. The bill’s lack of provisions for training and its apparent permissiveness toward the open-carry of machine guns was too much for the committee. Though Rep. Martin did not agree with these criticisms, he pulled the bill down for amendment to ensure that it would not be legal for children to wield a gun. Several legislators suggested they might vote for the bill if it required some sort of permit or training for open carry, but Rep. Martin firmly resisted making a change. He argued that such a requirement would place a financial burden on impoverished people. The poor who couldn’t pay would be unable to exercise what Rep. Martin considers a constitutional right to bear arms in the open. In response to the comment that anyone who owns a gun can also afford a training course, Rep. Martin responded that a gun might be inherited or earned from some sort of program.